Polyester Cord: White 1.5m x 20mm. A thicker cord for use with pyjamas, dressing gowns and similar garments. Machine washable. Use a Hemline bodkin for easy threading of replacement cords. 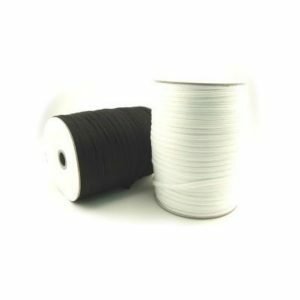 Polyester Cord: White 1.5m x 6mm. A thinner cord useful as a replacement in anoraks, sportswear, party costumes etc. Machine washable. 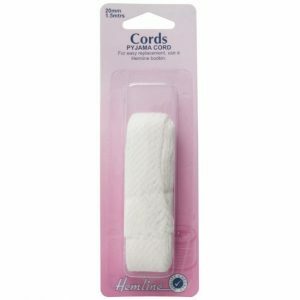 Use a Hemline bodkin for easy threading of replacement cords. Board Short Cord – Specially Woven Drawcord with a Soft Feel and Dries Fast. Soft Supple Finish 3mm wide. 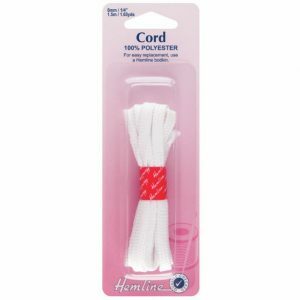 Hood Cord – Tightly Plaited, 6mm Cord In A Range Of Colours. 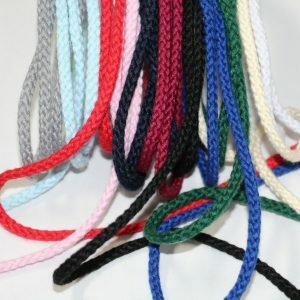 Hood Cord is a durable, firmly plaited cord which is strong with a smooth finish to use for clothing and craft. Available in a popular selection of colours, cut to length required, or full roll size is 50 m.